Albert Contreras, "Untitled," 2008, acrylic on panel, 20 x 24"
Albert Contreras, born in L.A in 1933, developed his immense artistic talent as a young man in Stockholm Sweden during the early 1960’s. A decade later he gave up painting altogether for twenty-five years. Having returned to L.A. he began painting again 1997 and, as this show confirms, his practice regenerated itself with a vengeance. The exhibition presents a range of Contreras’ abstract built-up, impastoed acrylic on wood panel paintings. While consistently poetic, many of the paintings in the show configure themselves into the geometric patterns and shapes for which the artist at the time of his death in 2017 had become known for. Refreshingly original, Contreras’s work also craftily blends some of the signature Neo-Expressionist, Pop, Op, Structuralist and Minimalist motifs one finds in the work of many of his his mid-twentieth century peers. For example, one stunning work presents a Jasper John’s-like image of concentric multi-colored rings. 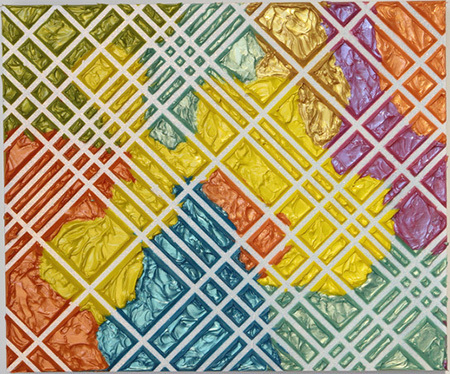 The painting succeeds both as an homage to Johns’ well-known rendering of an object, the “Target,” that stands as a visual sign in and of itself and a nod to Frank Stella’s programmed canvases, whose paint creates and defines the self-referential spaces they occupy. In a softer register, Contreras often mixes textured and granulated sand-like material into his paint to create shimmering, iridescent and other worldly works that warms, enchants and spiritualizes the entire exhibition space. Among the most engaging pieces in the show is a triptych of three red, blue and yellow round discs, whose textured paint resembles glazed and fired ceramic plates, while suggesting a set of Zen inspired and psychically balanced mandalas. Ultimately it's the vigorous, confident yet fragile feeling of life itself that blossoms from Contreras’ ingenious hybrid of organic and geometric forms that marks the crowning accomplishment of both this show and of this very endearing artist’s career.